Blast from the Past Bash! Reunion 2019 begins in just a few days, so we’re rolling out the red carpet for our alumni and looking forward to their visit. From Friday’s Golf Tournament, individual class parties, and school tours, to a Jamaica Project luncheon, the Bash from the Past and our 50-Year Memorial Service and Brunch, it’s a weekend of memories and of rekindled friendships. We hope to see YOU at Reunion. Photos from this weekend’s events will be posted on our website in several weeks, so be sure to take a look. This summer begins our strategic planning process, based, in part, on a very extensive project published in the Journal of Dental Education in 2017 and 2018. Conducted for, but independently of, the American Dental Education Association, “Advancing Dental Education in the 21st Century,” covered an array of factors impacting dental education including student debt and the number of graduates, to the number of dental schools and the roles of faculty. 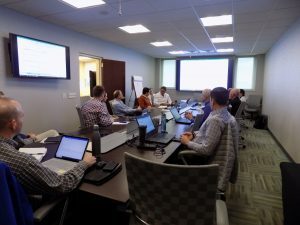 To streamline the data for use with our strategic planning process, I created my own summary notes of the ADEA project, which you’re welcome to review. Meeting with space planners and architects to design the new dental clinics. After jump-starting the planning process – thanks to our new architectural team – we now have floor plans showing the dental clinics in the new VCU Health adult outpatient facility. This new facility is coming out of the ground at the corner of North 10th and East Leigh streets where the former Virginia Treatment Center for Children once stood. It’s good to have something tangible in hand that shows our two dental floors. I suspect there will be adjustments before I can unveil the completed plans, so stay tuned. The new building is slated for completion in late 2020. We’re updating our HIPPA policies and making sure everyone is aware of the changes in those policies and what’s required by law. This is a constant educational process to make sure we’re on top of the requirements and that we’re all protecting the health information of our patients. Thanks to Wendy Montague, our HIPPA compliance specialist, for leading these efforts. 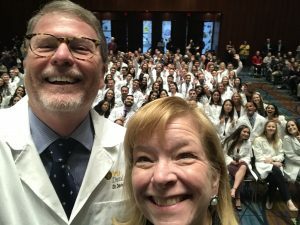 Pamela Zarkowski, J.D., provost and vice president for academic affairs at the University of Detroit, Mercy, joined me to celebrate our students at the 2019 White Coat Ceremony. Earlier in the day, she had presented “Go- Stop- Yield: The Intersection of Law and Ethics” as part of the School’s annual Mirmelstein Ethics Lecture series. It’s always a pleasure to be a part of our White Coat Ceremony. Celebrating this student milestone makes us all very proud. 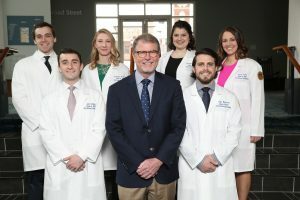 The 2019 ceremony for the Dental Hygiene Class of 2020 and the Doctor of Dental Surgery Class of 2021 was held on March 1. Congratulations! I enjoyed spending time with Legacy Luncheon students as part of the White Coat Ceremony.